Zapzapmath Preschool counting games allow students to practice their counting and addition skills. How many ones can you add up to make a ten? It’s time to pop some numbers and find out! Tap Ones bring together the adventure of exploring addition with the fun of popping bouncy groups of alien cells! Your duty as a mathling-in-training begins with our preschool counting games. There are some very happy cells waiting to be studied, and they need your help! In order to join themselves up into answers of values 10 and below, they need to know how to do basic addition . To play our preschool counting game, Tap Ones, and assist the cells in understanding counting and addition with ones, you are required to bring your best tapping skills to the screen! Each blue cell represents ones, and by tapping on them, you can add them up. But that is just the beginning of the fun! 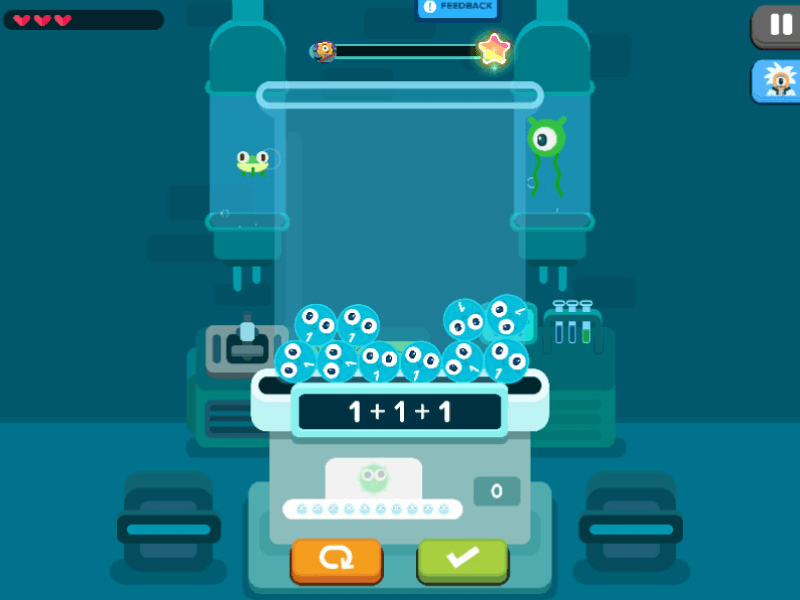 Now that you have mastered the art of popping the numbers, it is time to get calculating! Start each level by examining the number shown on the control panel. Counting can be tricky, but patience is key. To insert your answer into the control panel, tap each cell add them up until you get the amount that you need. If the question shows '3', you have to count and tap three cells, no more and no less. Each cell that you tap on will be indicated on the control panel below. The control panel will also total up your results for you. Once you have your answer, submit it by tapping on the green button and revealing the results. If you make a mistake, do not worry! To try again, return the cells back up by tapping on the orange button next to the green button. You can do this as many times as you need, so just keep trying until you get the right results! With Tap Ones, you will be counting to ten, making connections between number names, written numerals, and quantities up to ten. It allows you to improve your counting skills with the comprehension of how numbers are related to the amount of objects. The goal of Tap Ones is to exercise the identification of numbers as building blocks. By exploring numerical values in both objects as well as digits, players will learn to inquire in different forms of concepts while adapting to the addition and subtraction of components. This promotes a better range of critical thinking, while maintaining strong and enjoyable math practice that will translate into daily life. Are you ready to pop those cells and gather some ones? Let’s get started by playing our preschool counting games! This preschool math is a ten out of ten!